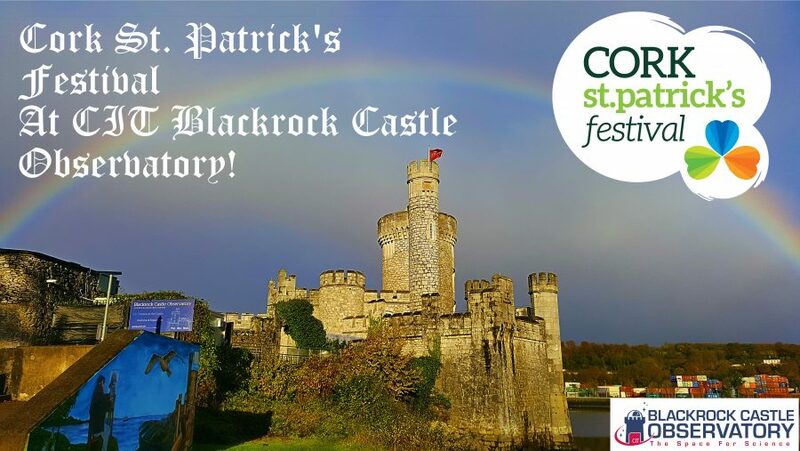 Join us in celebrating the Cork St. Patrick’s Festival at CIT Blackrock Castle Observatory! We’ll be kicking off the festivities with a First Quarter Moon Event on the 15th of March. From 6 pm we will be setting up telescopes in the courtyard to get up close and personal with the Moon*. If you’ve never experienced the excitement of using a telescope before, this is the perfect time to start! Meanwhile, in MakeSpace we’ll be hosting a walk in art session where you can use lino printmaking techniques to create your very own print of the Moon. The First Quarter Moon Event is Free to attend, and no booking is necessary**. Additionally, for the duration of the Cork St. Patrick’s Festival, our regularly scheduled Castle Tours will be available in Irish on request. Opening hours as normal. *Observing, as always, is weather dependent. In the event of inclement weather, observing will not proceed. **In the event that attendance exceeds capacity, participation in the art session will be allocated on a first come first served basis.